Ceramic tiles and mosaics provide a hard-wearing, easy-to-clean finish in the kitchen and bathroom. Water-proof and stain-resistant, they are decorative and practical. On both walls and floors they’re extremely hard-wearing. As backsplashes around sinks and above kitchen and laundry room worktops, they are waterproof and will repel water and stains. As wall-to-wall tiling, in place of paint or paper, they are the ultimate low-maintenance material for bathrooms and shower rooms; if tiles are correctly fitted, they will outlast the bath and basins they surround. Coloured and fired in a kiln by craftsmen, they may or may not have a protective glaze. 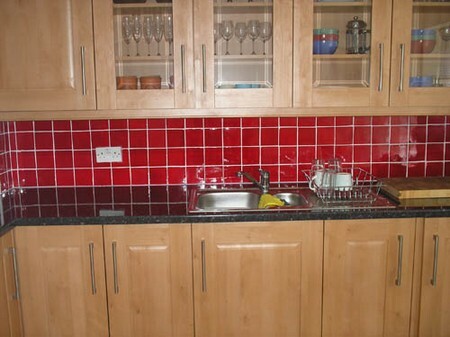 Unglazed tiles – which have a matt finish – stain easily and will be porous. The surface of each tile may not be entirely uniform, but it does add to the decorative effect. There is no standard size for handcrafted tiles, which can be square or rectangular, but most are between 7.5cm and 15cm (3in and 6in) wide and the cost will reflect the craftsmanship. These are cut from sheets of clay and have a protective glaze on the surface. Tiles come in every colour as well as printed designs to suit most colour schemes and interiors. The most popular size is 15em (6 in) square, but they are also available as 10cm (4in) and 20cm (8in) tiles, in the shape of rectangles, and tiles for mosaics. Many people cut costs by having just three rows of tiles above the basin and bath. If your budget is restricted but you want to tile the whole wall imaginatively, try plain white factory tiles, with occasional picture tiles for interest. with handcrafted tiles. This can be done, but you must match the tile thickness, as well as width and height. It’s great to be bold with colour and design, but remember that your bathroom colour scheme may change and re-tiling is expensive. Always buy ten percent more tiles than you need in order to allow for breakages. Many tile shops let you return unopened boxes after you’ve completed a job. Paint them a diiterent colour. Use specialized primer, then paint. Change the grouting colour with grout stain. Decorate with tile-transfers; peel and stick on a colourful design every few tiles. Get creative with ceramic paints. Stick a template of your outline onto a tile and get painting.